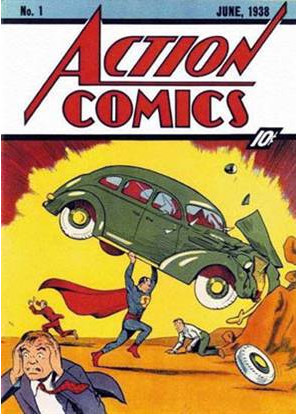 Superman was evidently intended to be a kind of anti-car terrorist when he debuted. In the West, most children (admittedly generally male, but let’s leave gender politics out of it) grow up knowing about superheroes. It’s probably been this way since comic books came mainstream, in what, the forties? Superman made his first appearance in ’38, so let’s say a couple of years later his popularity and that of imitators had blossomed. Every kid has been exposed to them since Supes turned up, and it’s fair to say that most children lap it up. Not that it’s just children, either- I know plenty of adults who retain their love for superheroes well into their lives. My father, for instance, adores the Silver Age work even now. He gave me a Marvel annual when I was young which contained what remain some of his favourite stories- the origin of the Hulk, the Avengers, and the Fantastic Four, and I know he still reads it.